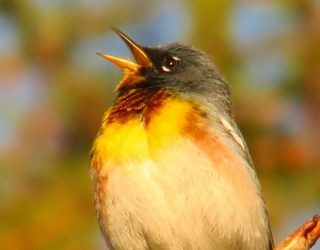 ‘Cats and Birds Living in Harmony’ was one of six themes at the Stewardship Roundtable hosted by our partners, the Stewardship Centre for BC, at the International Ornithological Congress in Vancouver in August. Representatives from Nature Canada, the BC SPCA, the Canadian Wildlife Service / Environment & Climate Change Canada and Cats Safe at Home Portland discussed best practices with a group of about 60 bird conservationists. After a brief introduction to the issue from Tanya Luszcz from Environment & Climate Change Canada, Amy Morris described the BC SPCA’s work to decrease outdoor cat populations. The results of the intensive low-cost spay-neuter, public education and feral cat programs programs they’ve done in 10 communities across BC include an overall 56% decrease in kittens entering shelters, increased reclaimed-by-owner rates, elimination of waitlists to surrender animals and increases in the proportion of cats adopted. Some recent research they conducted in BC indicated that only 39% of the public (both cat owners and non-cat owners) feel their local government should regulate whether cats roam, so they work to educate the community prior to introducing legislative change. Ted Cheskey and Sarah Cooper from Nature Canada described the collaborative approach of Keep Cats Safe & Save Bird Lives and the Best Practices developed in conjunction with our partners. Included were series of recommendations for Best Practices in Communications. •	Support the development of a comprehensive, long-term plan to address outdoor cats in your community: Owned, stray and feral cats all interact (i.e. owned cats can become lost or stray, and if not sterilized breed with stray or feral cats, stray cats can become feral over time, some feral cats can be acclimated to human contact, etc. ), so efforts to reduce outdoor cat populations need to include different approaches for each category of cat, in addition to consideration of wildlife. •	Employ collaborative, community-wide approaches including both cat welfare and wildlife conservation organizations as they offer the best opportunity to address the issue without generating undue community conflict. •	Increase effectiveness of municipal bylaws by preceding or accompanying efforts with extensive community education and outreach campaigns (see “The Calgary Model”). •	Implement collaborative approaches to community education and science-based municipal policy. •	Analyse barriers to understanding of the issue, such as lack of information or resources, poor relationship between cat advocates and wildlife conservation groups, etc. •	Use Best Practices in Communications (Best Practices – Communications). •	Evaluate and measure impact of any efforts (SMART goals for public engagement; polls to measure changes in attitudes and practices; changes in outdoor cat population, etc. Ultimately, the solution needs to emphasize importance of both cat and bird welfare. 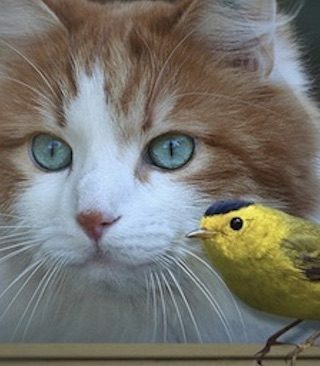 Together, we can find solutions so cats and birds can live in harmony!